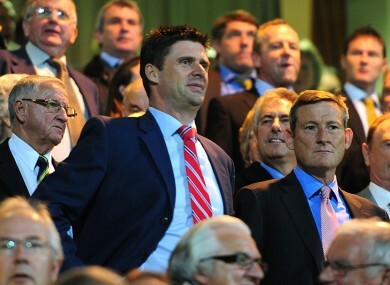 Niall Quinn, former chairman and director of international development at Sunderland. REPUBLIC OF IRELAND legend Niall Quinn is leaving Sunderland after six years on the board at the Stadium of Light. Quinn, 45, has been in charge of international development since October last year, when he was replaced by owner Ellis Short as club chairman. The former Arsenal and Manchester City striker will now return to Ireland to spend time with his family and concentrate on his business interests outside of football, a statement said. Quinn finished his playing career with the Black Cats, where he made over 200 league appearances between 1996 and 2002. After hanging up his boots, he spearheaded an “Irish invasion” by the Drumaville Consortium, which included publican Charlie Chawke and hotelier Louis Fitzgerald. Drumaville bought a controlling stake in Sunderland in the summer of 2006, and Quinn was briefly installed as both chairman and manager before he stepped aside to appoint Roy Keane to the dugout. Quinn remained as chairman when American Ellis Short completed his buyout of the club in May 2009, and stayed on in the position until his change of roles in October 2011. “Back in 2006 I had no business experience and little formal education and yet the fans backed me and believed in what I was trying to do,” said Quinn. One thing is for sure though, I’ll still have that knot in my stomach before kick-off and the feeling of pure elation at [the] final whistle if the result has gone our way – that will never leave me. Short, club manager Martin O’Neill and chief executive Margaret Byrne all paid tribute to Quinn today on his departure. He has been the heartbeat of the football club for so long and his legacy is immeasurable. To me he is ‘Mr Sunderland’ – and always will be. Email “Time to say goodbye: Niall Quinn parts ways with Sunderland”. Feedback on “Time to say goodbye: Niall Quinn parts ways with Sunderland”.